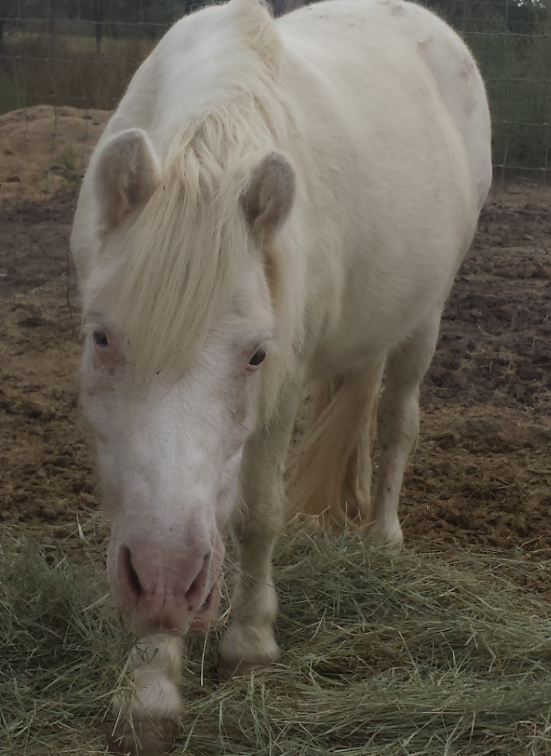 TOPPER, our darling solid white miniature horse. Topper absolutely loves kiddos. The more kids, the happier he is. He is a boy, but that does not stop him from dressing for all occassions, even princess parties. Topper has a 50 lb weight limit for riders. Ages up to 5 years old or weight limit. lesson pony for that child who dreams of having a pony one day. personality and loves to be with people. As you can see, this boy looks good in pink. Cowboy has a 75 lb weight limit for riders. Ages 6 years old and up to the weight limit. SASSY is a real cutie pie. 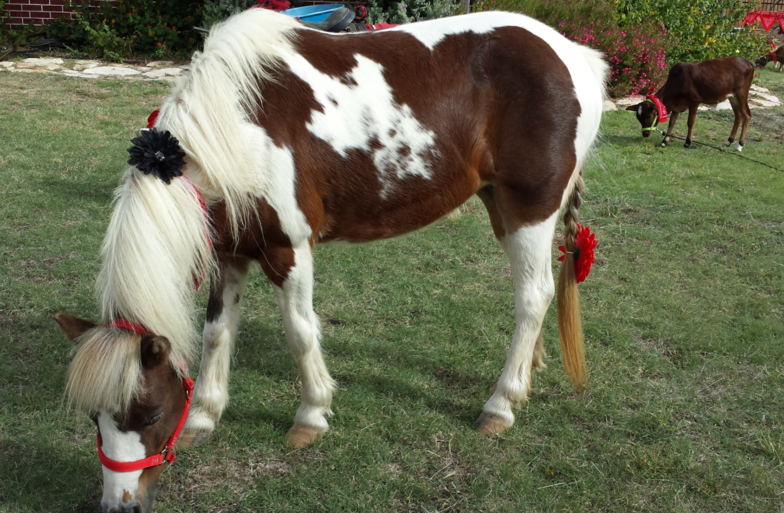 She is a tiny miniature paint horse. Sassy loves to be brushed and petted. Sassy is most definitely "sassy" and has the most fun and loving personality that anyone could hope for. She looks darling no matter how she is dressed and enjoys every minute of it. Sassy is very tiny and is for petting only. This is our PONCHO. There is so much I could say about this special guy, but not enough space to write it on. Poncho is my inspiration. Without my walk with him through his tragedy and without my witness to his triumphs, I would not be where I am today with all the wonderful pets and ponies to share with so many. You will understand more by viewing the "Read About Poncho's Hope" page on this website. God is good and Poncho is His good and faithful servant on this earth. Poncho can no longer give rides but he still has so very much to give to us. He loves to be petted, hugged and loved. Poncho will give many, many kisses for treats! He loooooooooves carrot treats!!! BEANIE BABY is our pocket pony deluxe. She is a miniature horse with the cutest delicate body - like taking a full-sized horse and shrinking him down to pocket-sized. Beanie Baby loves to be brushed, petted, hugged and justing having all the attention possible. She has the sweetest personality and no one can help but fall in love with her. Beanie Baby and Sassy, pictured above, are best buddies and we always let them travel together. Beanie Baby is very tiny and is for petting only. BUTTERCUP is our flashy little girl. She is a beautiful paint Shetland who is striking to look at. She makes for a wonderful picture pony. Buttercup has the calmest, sweetest personality. She is one of the first ponies to come up to us in the pasture. Buttercup loves big hugs around her neck and a gentle hand loving her face. 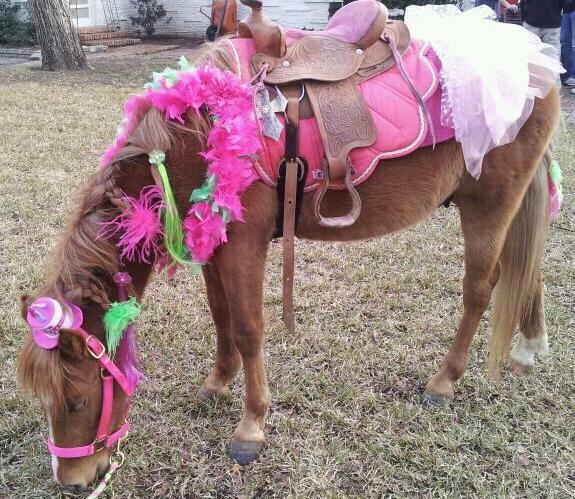 Buttercup is a medium-sized pony and has a 65 lb weight limit for riders. Ages 6 years old up to weight limit. 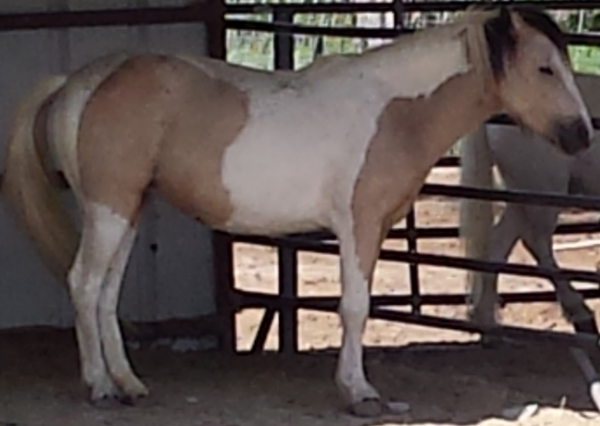 BRANDI is an exceptionally beautiful buckskin paint Welsh. 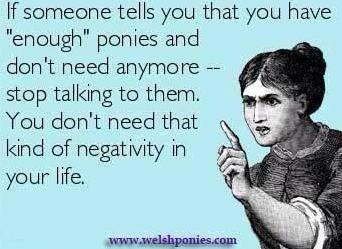 She will also make an awesome picture pony. Brandi is still in training. She had been turned out to pasture for a couple of years when we bought her. Brandi is shy right now but still cannot wait to greet me in the pasture. She always nickers to say hello. She is curious and loves to checkout all that we are doing. Brandi is coming around quickly and I have no doubt that she will become a dependable lead-line pony that every child will love to take a ride on. 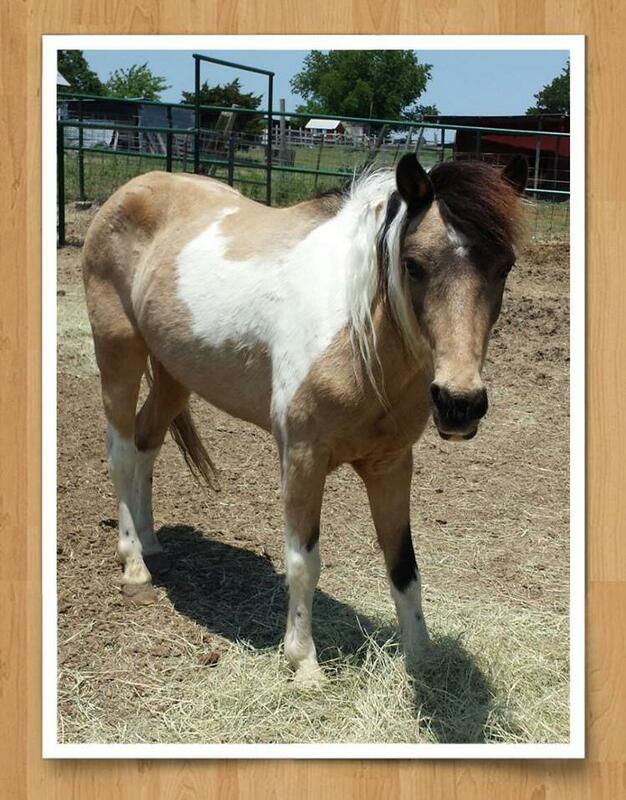 Brandi is a medium-sized pony and will have a 65 lb weight limit. Ages 6 years old up to 65 lb weight limit. CHA-CHA is our darling little Welsh yearling. She is most definitely a pocket pony and loves attention. 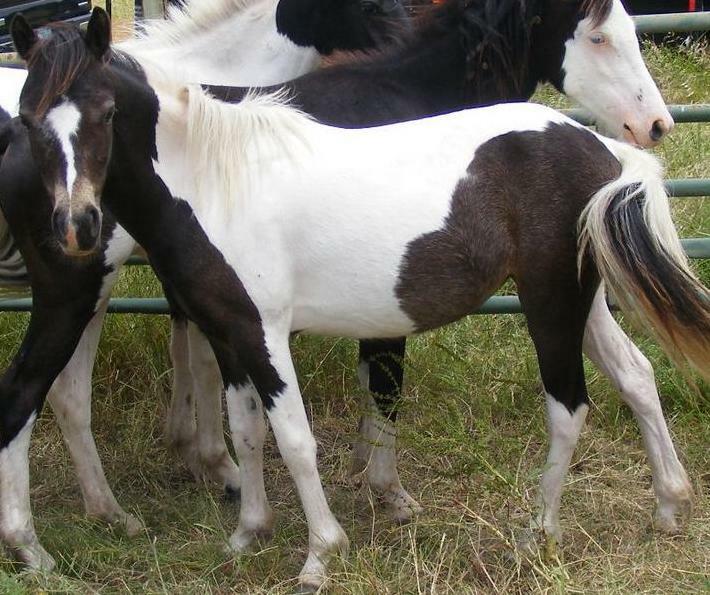 lead-line pony for sometime because she is so young, but she will be traveling with us to be petted and loved on by all the kids. TINKERBELL is our solid white little girl. 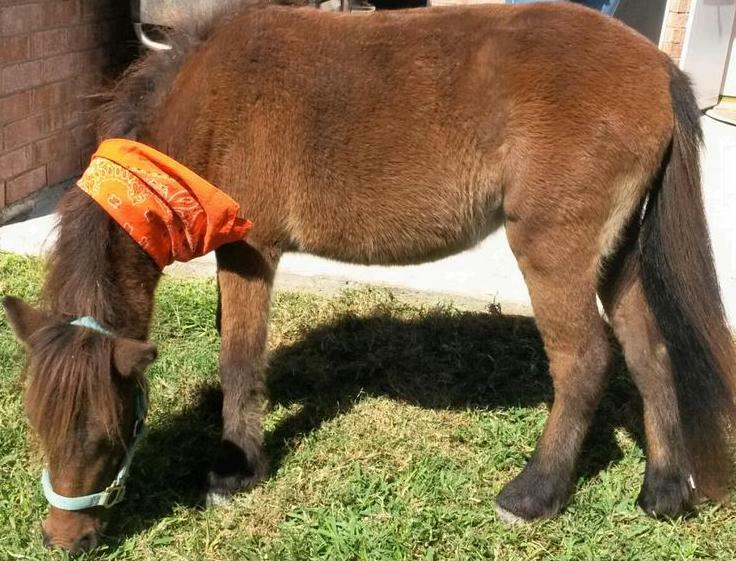 She is a butterball of a miniature horse. 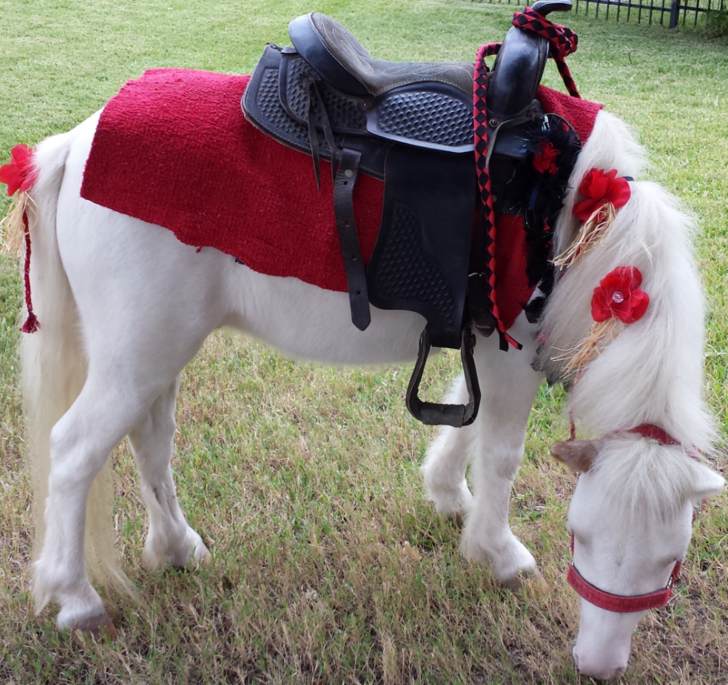 ​Tinkerbell loves attention and is the little pony we bring when a client requests a "Pony Ride with Decorating Pony." 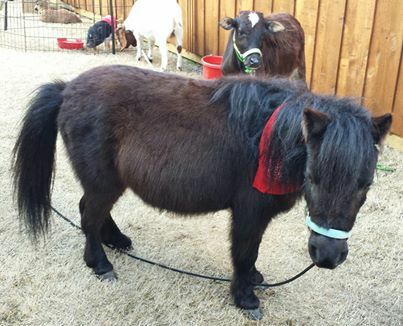 Tinkerbell is a small miniature horse and is for petting and decorating only. 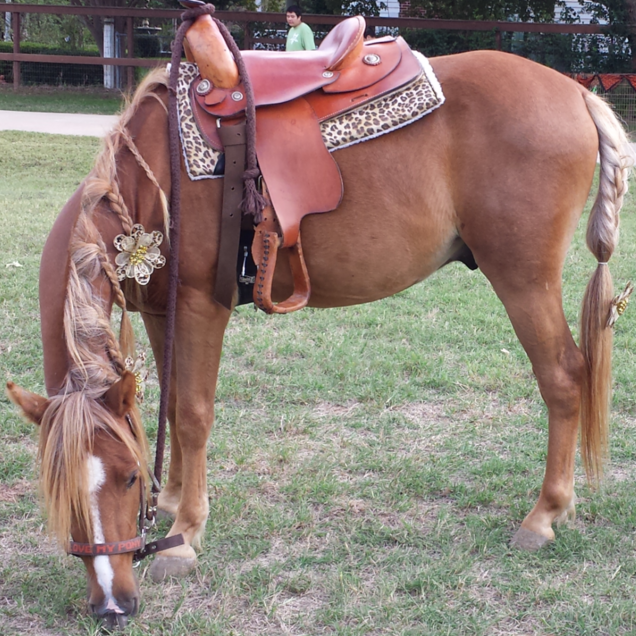 SPIRIT is our beautiful buckskin pony. He is a lovely pony with a lovely personality. Spirit is a wonderful riding pony and he loves children. We have more pictures coming soon. 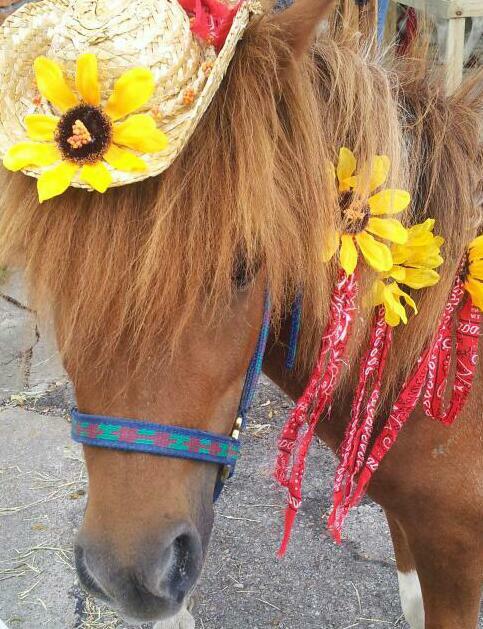 He will look awesome dressed as a cowboy pony. Spirit has a 50 lb weight limit for riders. Ages up to 5 years old up to weight limit. Our sweet, itsy-bitsy Gizmo. He is the littlest little guy...he is the sweetest little guy...he is the cutest little guy. Your kids and little guests will love our Gizmo for many reasons, but mostly because he is not much bigger than them. 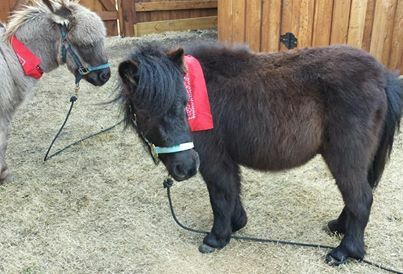 Gizmo is very tiny and is a petting pony only. 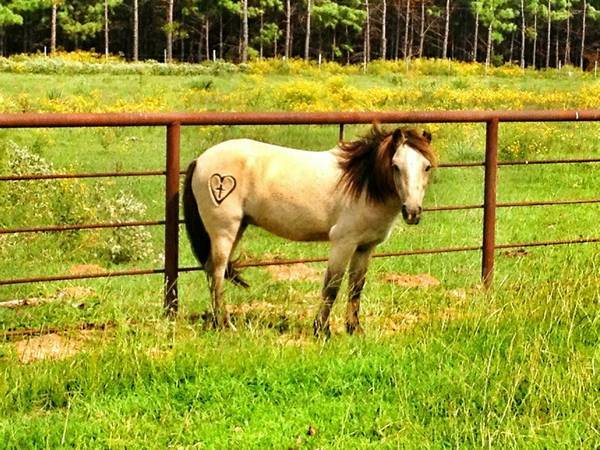 GERONIMO is one of our larger ponies. He has the most quiet and sweet personality. Geronimo is such a beautiful boy with awesome markings. 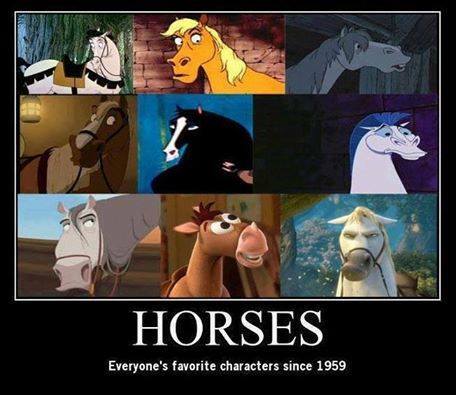 He will make a wonderful picture pony. Geronimo is most definitely a terrific riding pony who the kids will, no doubt, have a fantastic time with. Geronimo has a 75 lb weight limit for riders. Ages 6 years old and up to weight limit.